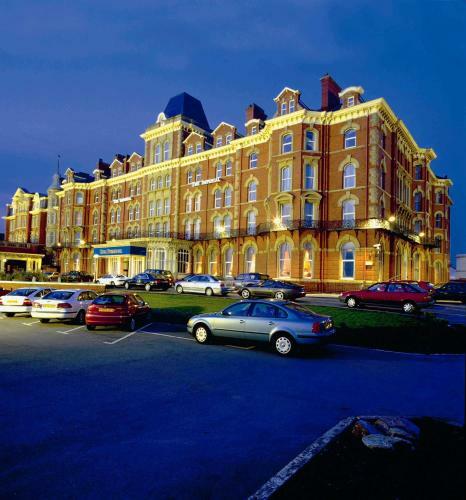 Big hotel with a big heart capable of satisfying the biggest family holidays in Blackpool. Located on the Prom just a few hundred yards from North Pier. The Imperial Hotel is perhaps most iconic hotel in Blackpool. Anybody who holidayed in the resort as a kid is likely to remember this one as you strolled passed North Pier with your bag of chips or stick of rock in your hand. You have the Hilton just up the road and outside you have the Wilton Parade tram stop. There's a service running every five or six minutes in peak season, making the trek down to the Pleasure Beach and Blackpool Tower a pretty simple and speedy affair. The hotel enjoys some breathtaking views of the Irish Sea and the North Shore location means its suitable for all those people keen to avoid the fuss and the frenzy of South Shore. This is the quiet area of town where you can kick-back and relax without having to tolerate the usual hen and stag party rabble. Terrific seafront location with views to North Pier. Health and Leisure Club featuring Indoor swimming pool, sauna, steam room, jacuzzi and beauty/therapy rooms. The onsite Palm Court Restaurant offers a first-class menu and has panoramic views across Blackpool promenade out to the sea. The 'Make Me Blush' Restaurant offers casual take on dining and is open 10.00am til 10.00pm daily (wines and cocktails available).